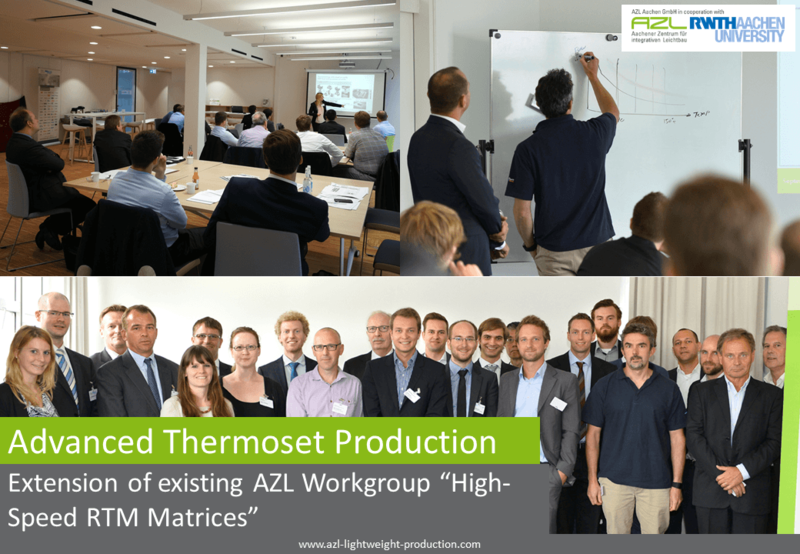 AZL is expanding its existing Workgroup “High-Speed RTM Matrices” to a new Workgroup named “Advanced Thermoset Production”, based on requests from various AZL Partners. The extension was motivated by numerous innovations in the area of thermoset processes which only can be partly covered by the so-far workgroup focus on RTM. The Workgroup “Advanced Thermoset Production” will address additionally to RTM Processes all relevant liquid composite molding technologies, prepreg technology, advanced pultrusion and more. During its first meeting on November 13th AZL discussed the new scope with its participating partner companies. The former Workgroup “High-Speed RTM Matrices” was founded in 2014 and – with 8 meetings in total – is one of the most established workgroups of the AZL Partner Network. The AZL partners had the interest to continue to work on this topic. Key topics of the past have been the standardization of RTM material data sheets, the needs for high reactive material test methods and the quality assurance possibilities in the RTM process. We are looking forward to an exciting extension of this successful Workgroup.